The family-owned and operated J&J Vinyl Fence has over three decades of experience in the fencing industry and is able to custom-build a vinyl semi-privacy fence according to the exact amount of privacy and security you'd like in countless visually appealing, practical designs. With superior workmanship, high-quality materials, competitive rates, and personalized service, we offer Los Angeles's best value in vinyl semi-privacy fence installation. Our seasoned experts have constructed vinyl semi-privacy fences for thousands of satisfied clients, primarily for those who want a maintenance-free fence that provides a balance of privacy, architectural appeal, increased airflow, and openness. Vinyl semi-privacy fences are completely customizable. They come in white or tan with the option of a wood-grain finish for natural looking texture. You may choose from a plethora of lattice or picket accents as well as styled or flat tops, including contemporary or traditional picket, scalloped, solar-powered lighting, gothic, and any variation of the above. To ensure that our vision is your vision, we meticulously assess the needs of each client and take accurate measurements of their fencing needs. We then issue an honest and affordable quote, thoroughly explaining all costs and services. Once we have our client's approval of the estimate, we order the raw materials; customize the boards, posts, rails, pickets, and colors to your liking; and install it skillfully, in a timely manner. 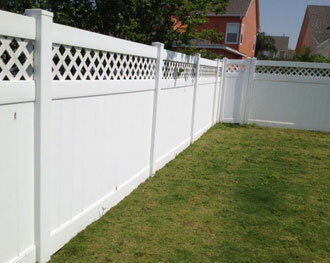 At J&J Vinyl Fence our highly trained, reliable experts will provide you with vinyl semi-privacy fencing that is highly durable, long-lasting and a charming addition to your Los Angeles property. Because we only work with materials manufactured by trusted industry professionals, all of our vinyl fences are backed by transferable limited lifetime warranties. Call J&J Vinyl Fence today to set up a free consultation, either on site or over the phone. We offer a 10% discount on our fencing installation services for first-time customers.